Land Rover brought out the first-generation Range Rover Evoque compact luxury crossover for the 2012 model year, and it was an instant success. 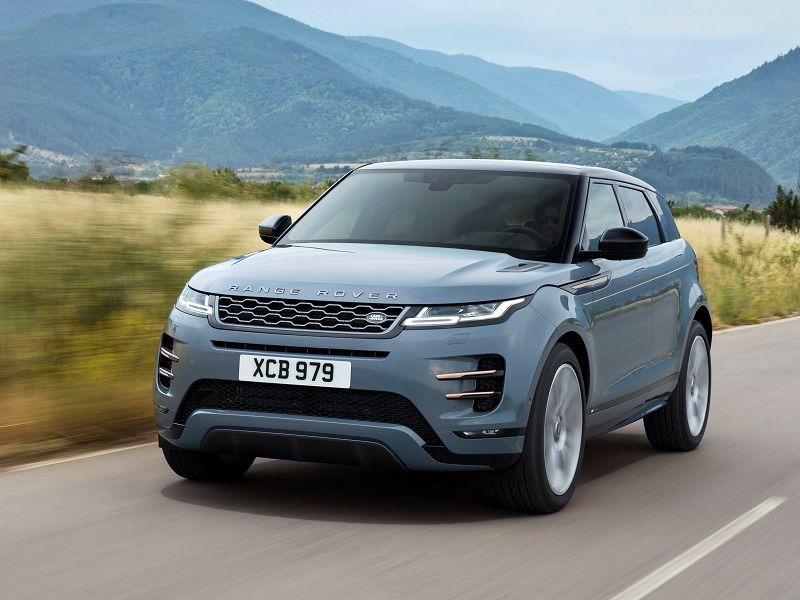 As a lower-priced, urban-friendly option, the Evoque quickly won a following and Land Rover has sold over 772,000 of the plucky little crossovers worldwide. Buyers love the Evoque for its manageable size, great performance, and more affordable price point compared to a full-size Range Rover. This new edition marks the first major redesign of the Evoque since its introduction, and Land Rover went all the way. The all-new 2020 Range Rover Evoque rides on an entirely new platform optimized for future plug-in hybrid electrification, has new exterior and interior designs, and it’s got a bunch of new suspension and driveline features underneath. Read on for all the news and driving impressions on the newest Range Rover. Land Rover constructed the 2020 Evoque on its entirely new Premium Transverse Architecture platform. 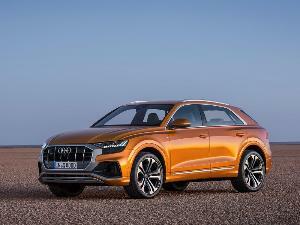 The new chassis is designed to accommodate batteries for a plug-in hybrid version of the Evoque expected to arrive in the fall of 2019. Land Rover has committed to offering electrification across its entire lineup starting with the 2020 model year. The “transverse” in the name means that the engine is oriented across the vehicle, like most front-wheel-drive vehicles. 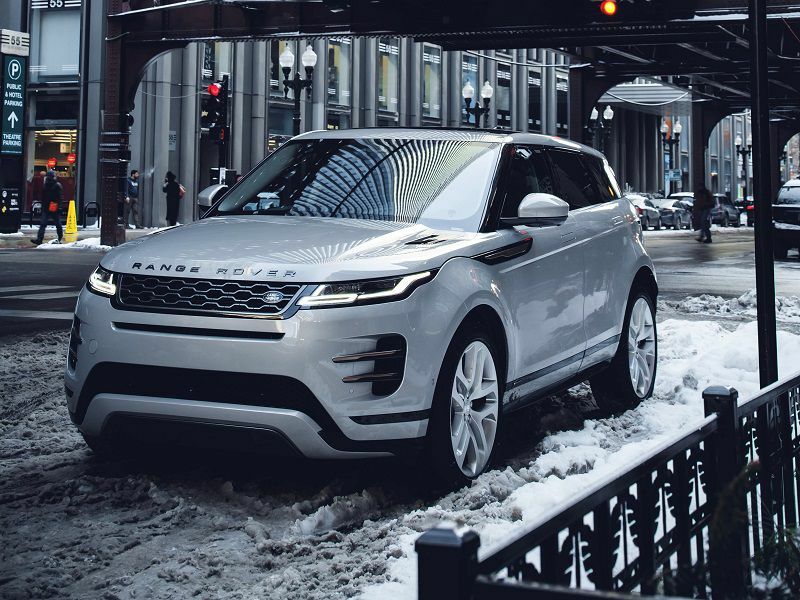 The Evoque is primarily front-drive, but its all-wheel drive system is always active and ready to engage the rear axle as needed. The new architecture also accommodates Land Rover’s innovative integral-link rear suspension, which is more compact than older rear suspension designs, while still delivering premium ride and handling qualities. The front suspension is a traditional MacPherson Strut design. An electronic active suspension option is available. 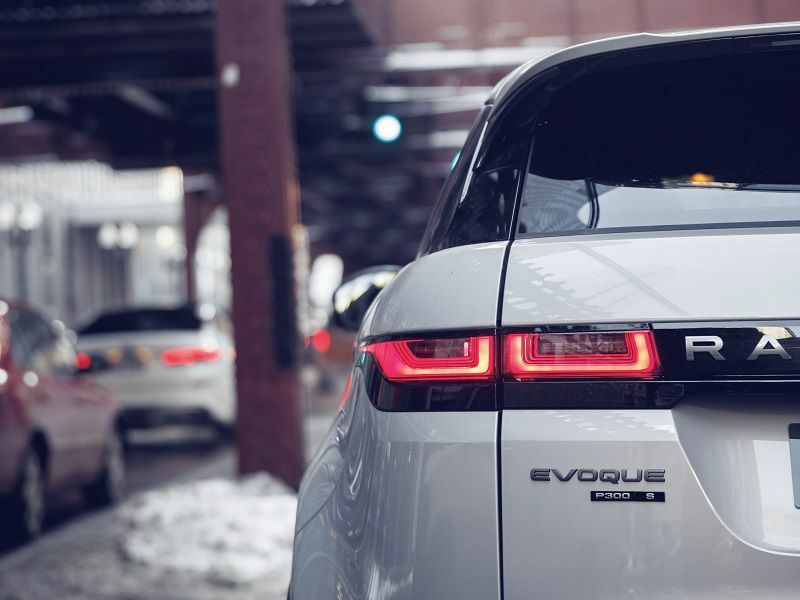 The basic engine on the 2020 Range Rover Evoque is a 246-horsepower, 269 pound-feet Ingenium turbocharged four-cylinder. This engine offers good performance, although throttle response can lag under some conditions. If budget is a consideration, this engine is an excellent choice for any buyer. 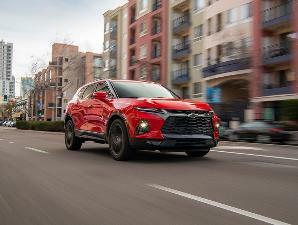 The upgrade engine in the R-Dynamics trim levels is a tuned-up 296-horsepower, 295-pound-feet version of the same Ingenium plant. In these trims, the gas engine is augmented by a 48-volt mild hybrid system that adds power at speeds up to 11 mph. At higher speeds, the hybrid system does not contribute torque, so it doesn’t affect the engine’s power ratings. Both engine options are paired with a ZF nine-speed automatic transmission. This gearbox is quick shifting and smooth, and it includes a sport mode that effectively eliminates throttle lag. Depending on the engine trim you choose, Land Rover provides two closely related AWD systems. Both offer rear-axle disconnection at cruising speeds to save fuel, but the advanced Active Driveline system offers real-time electrical torque vectoring to distribute power to the front or rear axle as needed to maintain crisp power and traction under cornering. Both AWD systems include Land Rover’s Terrain Response 2 driving modes. This feature offers five different modes to optimize the AWD system for varying conditions. Programs include general/automatic, ECO, Sand, Grass-Gravel-Snow, and Mud & Ruts. The default Auto setting allows the Evoque to select the best mode for current conditions. 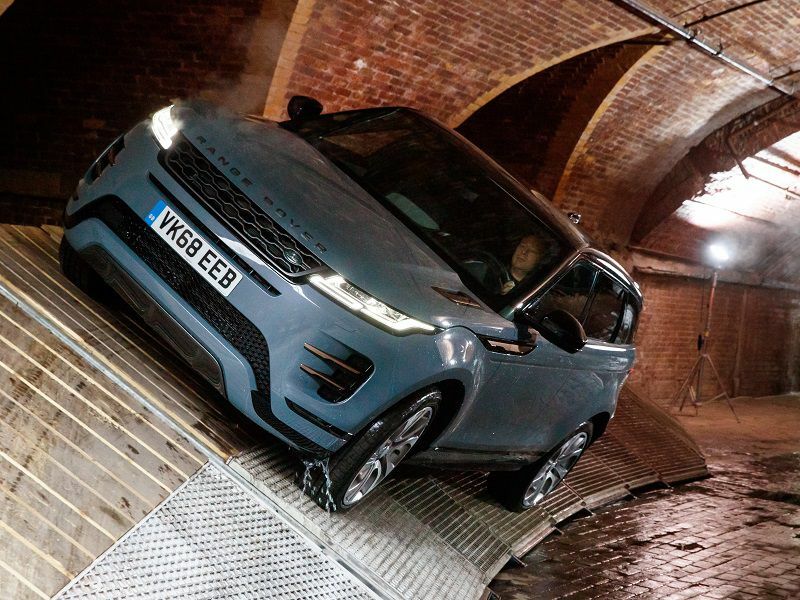 The Evoque also includes a new Gradient Release System that holds the vehicle on steep inclines and then modulates torque for a smooth takeoff. Hill descent control and Land Rover’s industry-unique All Terrain Progress Control low-speed off-road cruise control are also included. The new platform for the Evoque has many benefits beyond chassis stiffness and space for batteries. Rear-seat passengers will enjoy almost a full inch more knee room, for one thing. Also, because the rear suspension is more compact, the new Evoque offers improved cargo capacity across the entire vehicle. You can stash up to 21.5 cubic feet of stuff behind the rear seat, and up to 50.5 cubic feet with the rear seat folded down. One related feature is the available ClearSight rear view mirror, which displays the rearview camera view on the mirror when you’ve got the back full of cargo. Here’s a tip: The rearview camera has better low-light resolution than most people can see with natural vision. 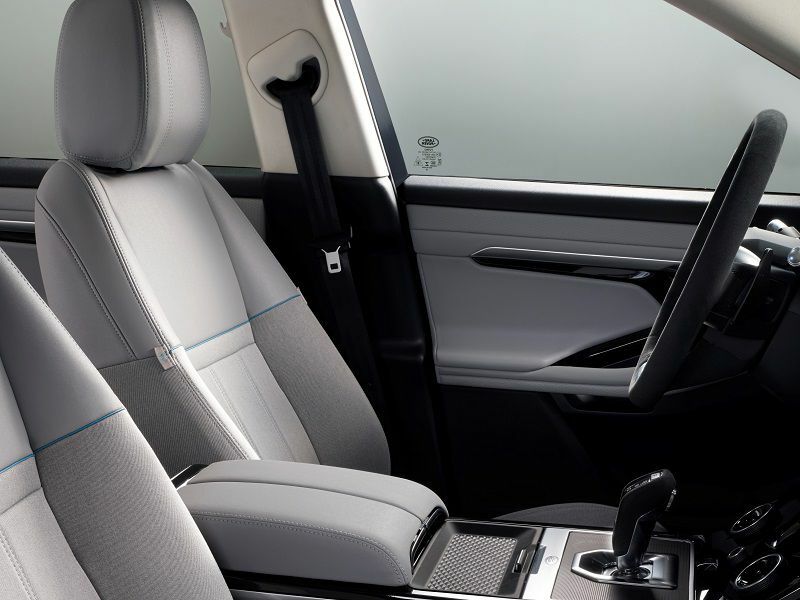 Part of Land Rover’s commitment to green technology is finding ways to use recycled materials in the cabin. 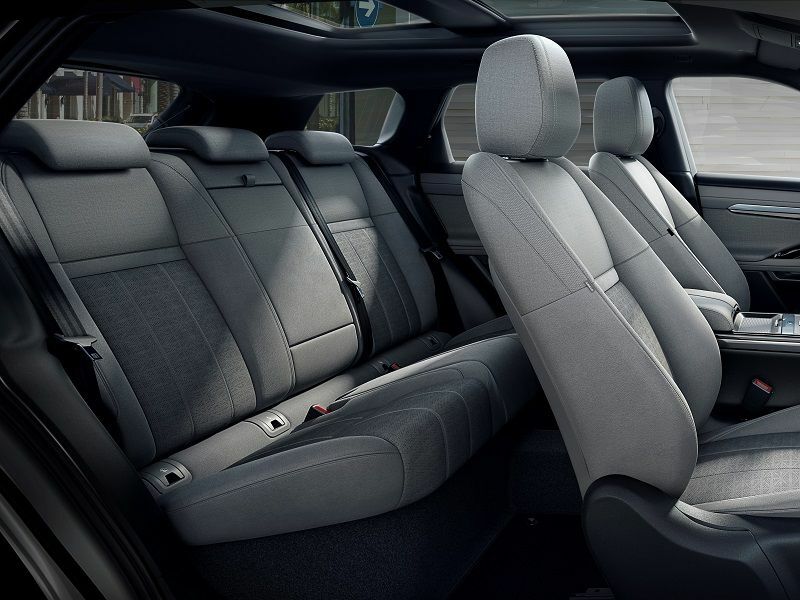 Depending on the trim you choose, up to 72.8 pounds of recycled or eco-friendly materials can find their way into the Evoque. The recycled materials are obtained from post-consumer or post-industrial sources within the Land Rover supply chain. For example, upholstery alternatives to leather include Danish Kvadrat, which combines a durable wool blend with a technical Dinamica synthetic suede made from recycled plastic bottles. There’s also an option for a new Eucalyptus fiber cloth that offers a luxury feel that makes an excellent alternative to animal-derived products. Traditional leather is still available for those who prefer it, however. 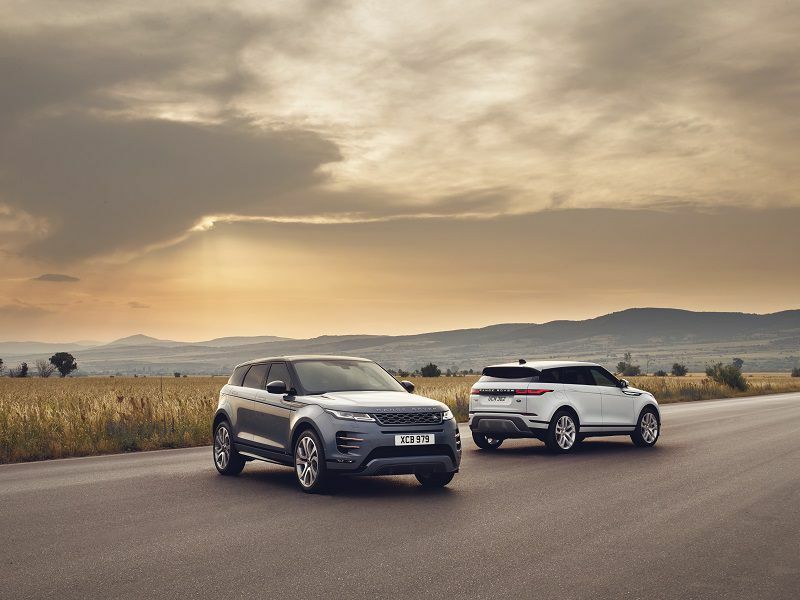 Land Rover emphasized simplicity in the 2020 Evoque design, and it has reduced complexity in the cabin with a new InControl Touch Pro Duo infotainment interface. The InControl system uses two 10-inch touchscreens on the dashboard. The upper screen controls the audio and navigation systems, while driving and cabin functions are located in the lower screen. 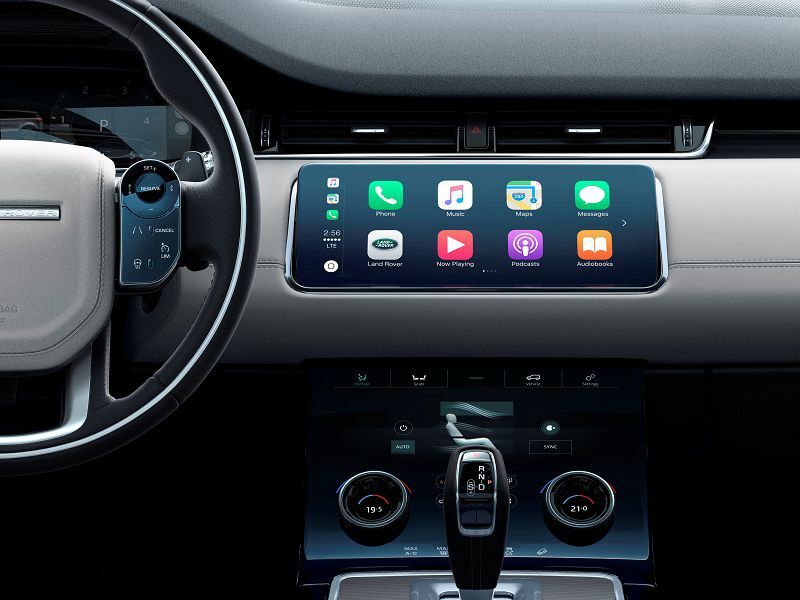 Both Android Auto and Apple CarPlay are supported through the USB port. A very good Meridian sound system is standard, and an optional surround-sound upgrade is available. Capacitive-touch buttons allow the driver to select features like hill descent control, while the main screen uses the familiar tab system to select control screens. This is where you choose the Evoque’s drive modes on the touchscreen or using two dials to move focus and select an option. You can also switch tabs to climate controls, and the same dials perform functions appropriate to that tab. Driving the Evoque is a pure pleasure, and you can expect exciting performance from either engine option. If you experience throttle lag, simply select Sport mode using the gear selector to sharpen up the Evoque’s responses, or use the available paddle shifters. 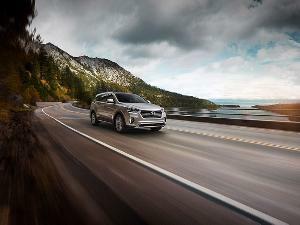 On the road, you can expect crisp, responsive steering and a firm but smooth ride. Land Rover has also made the cabin whisper-quiet, even when you’re riding on the optional 21-inch wheels with low-profile tires. The R-Dynamic Active Driveline system distributes torque to make the Evoque one of the best-handling SUVs you can buy. Off-road, we were impressed with the Evoque’s capability. The new model can pass through water up to 23.6 inches deep without difficulty, and it can climb extremely steep hills on a loose gravel surface. The Gradient Release and Hill Descent functions make it all easy. We were able to manage terrain that we never would have guessed the Evoque could handle. Technology like All Terrain Progress Control allows the Evoque to outperform other comparable SUVs. 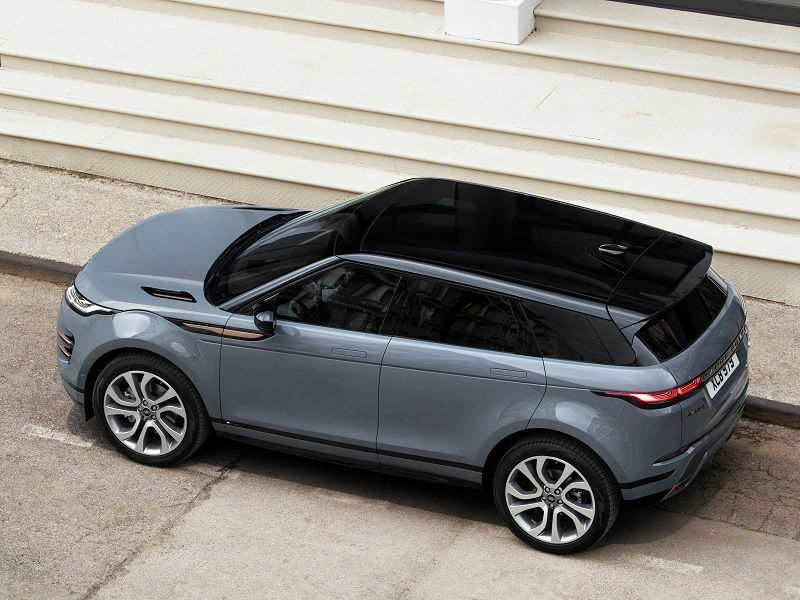 There are six trims to choose from with the 2020 Evoque. Three include the base engine at 246 horsepower, ranging in price from $42,650 for the base S trim to $47,200 for the mid-level SE and the top First Edition priced at $56,850. If you choose the mild-hybrid engine with 296 horsepower, you’ll get one of the three R-Dynamic trims, ranging in price from $46,600 for the base S to $51,150 for the SE to $55,800 for the top HSE. A destination fee of $995 will be added to all trim levels, and there are several extra-cost options that are independent of trim packages, such as the electronic adaptive suspension, advanced parking assistance, and advanced driver assistance functions. Other available options include a panoramic glass roof, and the ClearSight Ground View package that mounts cameras underneath the Evoque. It’s hard to come up with real rivals to Land Rover, because no one else is delivering the kind of off-road capability paired with top-shelf luxury that you get with a Range Rover. The closest competitor would be the 2019 BMW X3. 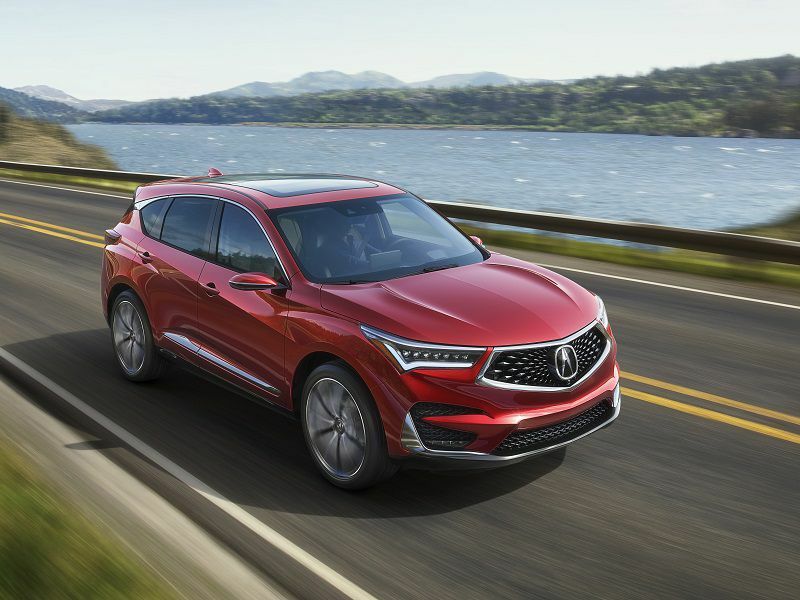 Buyers may also want to consider the 2019 Acura RDX or the 2019 Infiniti QX50 for a luxury comparison. 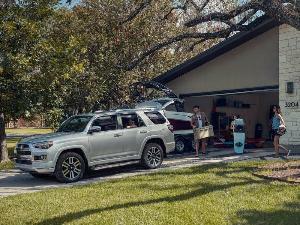 The 2019 Lexus GX 460 can be taken off-road, but it is much larger than the Evoque. If you’re looking for comparable off-road capability, some wild-card comparisons from the 4X4 segment would include the 2019 Toyota 4Runner, 2019 Jeep Cherokee, or 2019 Jeep Compass. These vehicles can follow the Evoque into the wilderness and come out again, but they won’t offer the same levels of luxury or technology. With the 2020 revision, Land Rover has done the impossible: It's made a great SUV even better. 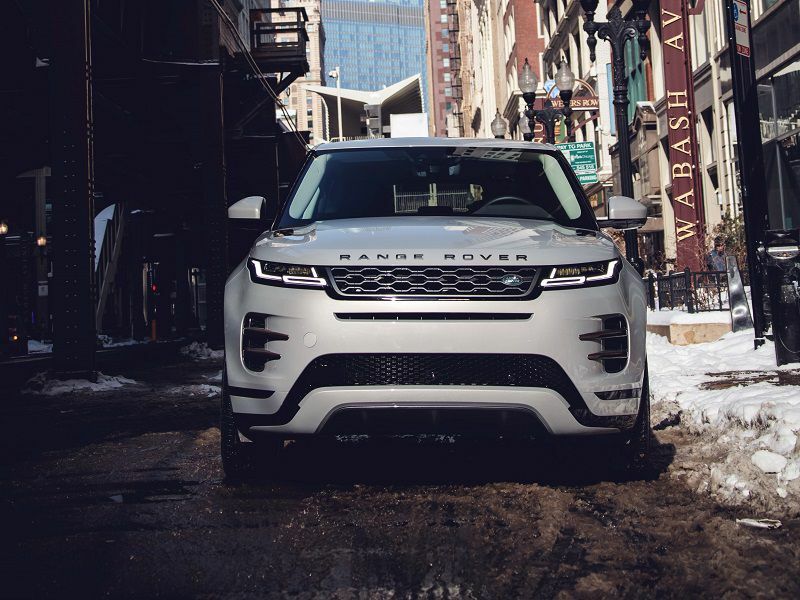 Combining the new platform, eco-friendly materials, enhanced off-road capability, and advanced driveline technology with Land Rover’s distinctive luxury touches, the new Evoque is every inch an authentic Range Rover. Buyers can fall in love whether they drive off-road or just drive around town. If we were to buy a 2020 Range Rover Evoque for ourselves, we’d be likely to choose the 296-horsepower R-Dynamic version with the mild hybrid system, but we’d pick the basic S trim at $47,795, including destination fees. Any trim level in a Range Rover is nice, and the important features are all included with the R-Dynamic package. With a price difference of less than $4,000, getting 296 horsepower, the hybrid system, and the active driveline system is a great deal.